Where was God when that happened? How will the world end? The Bible makes big claims for itself. But do those claims stand up? Aren’t the stories just legends? Hasn’t the information been corrupted over time? Isn’t the Bible full of mistakes? And isn’t it culturally outdated? In this absorbing little book, Barry Cooper explores these questions - and many others - with warmth, wit and integrity. Part of the Questions Christians Ask series: a range of short, simple books designed to help Christians understand what God has said about these questions and many more in the Bible. 1. Does the Bible claim to be God’s word? 2. Does the Bible claim to be God’s word? 3. Does the Bible seem to be God’s word? 4. Does the Bible seem to be God’s word? 5. Does the Bible prove to be God’s word? Excellent short book on the authority and authenticity of the Bible. I found it very encouraging and, for me, a must read. I found this book really helpful as it was concise, easy to read and full of great stuff. It reinforced many things I already believed but also broadened my understanding, particularly thinking about how Jesus viewed scripture, and by the end gave me even more confidence in the trustworthiness of the bible as the Word of God. I have since given it to a friend who is not a Christian but considering this issue. Well worth a read! This book says a lot in 81 pages. The author demonstrates well the authenticity of the Bible, showing how a single theme runs through all 66 books or 'documents.' Cooper meets head on the common criticisms laid against this book of books and answers them well. However you view the Bible, this is a must read. This little book is absolutely amazing. In more than 60 years of reading the Scriptures and studying many of the great Christian writers I have never come across a writer who presents his message as well as Barry Cooper does. In five concise chapters he coverers the whole topic of Biblical reliability. His clear down-to-earth writing style can be easily followed even by those who have not so far become Christians. Equally the book is a veritable mine of precious truths for those starting out with Christ and similarly a valued reminder of the things held precious by those of longer years. Barry Cooper models the layout of these five chapters on the three questions of Winnie-the-Pooh: ‘Does the Bible claim to be God’s word?’, ‘Does the Bible seem to be God’s word?’ and ‘Does the Bible prove to be God’s word?’ Each chapter concludes with a helpful Conclusion. Next to the Bible itself, I would suggest that every Christian should have a copy of this little gem, use it as a regular revision guide, and be prepared to share its contents with those who are seeking the Truth about God’s word. In this book Cooper lays out all the truths about the Bible and explains exactly why it can be trusted! As a student of World Religions at University I have learnt that many people are very critical of religion especially before they decide to follow that particular religion if this is you about trusting the Bible then this is the book for you! You can really see Gods word coming out through this book and its so easy to pick up and read. It gives a basic answer to some of those hard hitting questions many Christians and people reading the Bible ask! highly recommended by me and all those I know that have read it! The trustworthiness of the Bible is one of the biggest issues facing the Church today. Every Christian will be familiar with critics from all spheres of life who regard the Bible as being unreliable, outdated and divisive. Therefore, any resource that can both answer these objections and inspire credence in the word of God is going to be extremely timely and valuable. Refreshingly, I found Barry Cooper's book to be both. He has done a sterling job in producing a concise, informative and very readable book on the subject. He is unashamed in his conviction that we can have a firm confidence in the Bible. He demonstrates this by examining everything from its content to its composition. There are some very snappy, simple and compelling answers to some of the most common questions about the Bible which all readers will benefit from. He drops in some greatly reassuring facts about the Bible which help convince the reader that as they read the Bible they are reading the very words of God himself. In his usual witty and entertaining way, Barry tells us about his own personal experience of the transforming power of God's word in his own life and the life's of countless others. Echoing the words of the psalmist in Psalm 19, he closes with an invitation to 'taste and see' the sweetness of the God who reveals himself in the Bible. Perhaps you are a Christian seeking to know more about the Bible. Perhaps you are not a Christian but keen to find out exactly what the Bible claims to be and how it came to be. Whoever you are and wherever you are in terms of your beliefs you will benefit from time spent reading this short book. Can I really trust the Bible? You bet you can! I read the book initially to see if it would be something I would give away to others. I liked it so much I bought 50. I have conversations about Jesus every day and I have heard every complaint going on why people don't trust the Bible, don't read the Bible, and don't think anything of the Bible. This little book packs a powerful punch. I think I can get my apathetic friends to actually read it whilst it's content engages with a lot of questions I hear every day. Barry's style of writing is very engaging and in a way that I think my friends would enjoy reading. Highly recommend "Can I Really Trust The Bible" for yourself or as a resource for others. And it's so darn yellow.. what's not to like? 72 pages. Brilliantly written. On an important subject. And a yellow cover because 2014 is all about the yellow cover. Can I really trust the Bible? 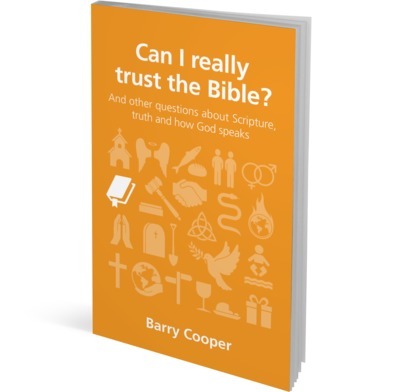 by Barry Cooper is a terrific new addition to the Questions Christians Ask series from The Good Book Company. You’ll be hard pressed to find another book that sums up what the Bible says about itself, what it is about, that it is reliable and trustworthy, how it came about and why it contains the 66 books it does, why we have these different translations, what it means for it to be inerrant, as clearly as this one does. Now if this was all this short book contained it would still be an excellent resource to put in the hands of Christians to give them confidence in the trustworthiness of God’s Word, and non-Christians to encourage them to take the Bible seriously. But then we have this final chapter where Barry stops giving us reasons why we can trust the Bible, and says its time for you to find out yourself. And “when you put God’s word into practice” that’s when “you know it’s for real”. Get this book into the hands of as many people you can and pray that God will use it to get them into the Book! In a very engaging, winsome and accessible way Barry Cooper has provided clear answers to questions about the reliability of God's word that real people really ask. For the Christian there is confidence-building encouragement on every page, and for the sceptic there is much on which to chew as the Bible's claims about itself are held out. This book is a great resource and reading it will be time well spent for anyone.